Today is the birthday (1887) of Leonard “Chico” Marx, a member of the Marx Brothers (with Groucho, Harpo, and Zeppo). His persona in the act was that of a charming, uneducated but crafty con artist, seemingly of rural Italian origin, who wore shabby clothes and sported a curly-haired wig and Tyrolean hat. 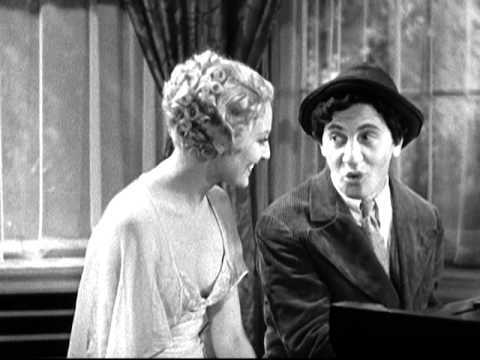 On screen, Chico is often in alliance with Harpo, usually as partners in crime, and is also frequently seen trying to con or outfox Groucho. 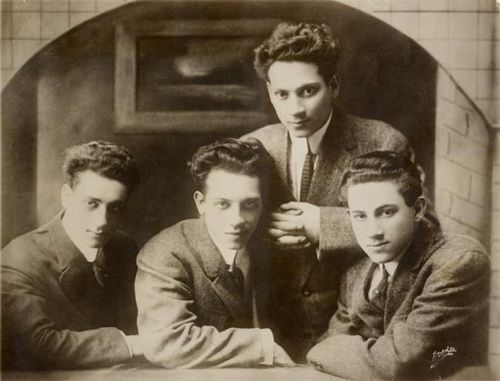 Leonard was the oldest of the Marx Brothers to live past early childhood (first-born Manfred Marx had died in infancy). 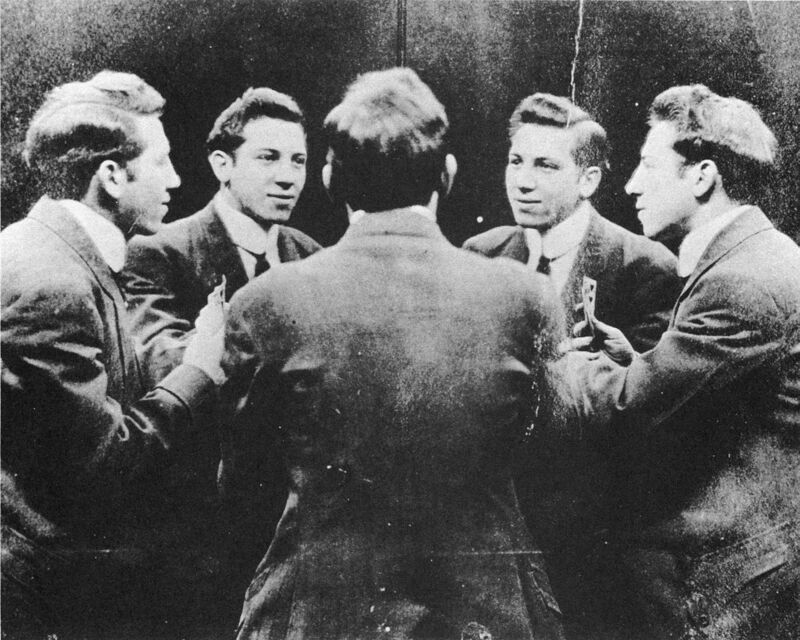 In addition to his work as a performer, he played an important role in the management and development of the act in its early years. Chico was born in Manhattan, New York City. His parents were Sam Marx (called “Frenchie” throughout his life), and his wife, Minnie Schoenberg Marx. Minnie’s brother was Al Shean. The Marx family was Franco-German Jewish. His father was a native of Alsace who worked as a tailor and his mother was from East Frisia in Germany. There are moments, however, where Chico’s characters appear to be genuinely Italian; examples include the film The Big Store, in which his character Ravelli runs into an old friend he worked with in Naples (after a brief misunderstanding due to his accent), the film Monkey Business, in which Chico claims his grandfather sailed with Christopher Columbus, and their very first film The Cocoanuts, where Mr. Hammer (Groucho) asks him if he knew what an auction was, in which he responds “I come from Italy on the Atlantic Auction!” Chico’s character is often assumed to be dim-witted, as he frequently misunderstands words spoken by other characters (particularly Groucho). However, he often gets the better of the same characters by extorting money from them, either by con or blackmail; again, Groucho is his most frequent target. In the brothers’ last film, Love Happy, Chico plays a piano and violin duet with ‘Mr. Lyons’ (Leon Belasco). Lyons plays some ornate riffs on the violin; Chico comments, “Look-a, Mister Lyons, I know you wanna make a good impression, but please don’t-a play better than me!” In a record album about the Marx Brothers, narrator Gary Owens stated that “although Chico’s technique was limited, his repertoire was not.” The opposite was true of Harpo, who reportedly could play only two tunes on the piano, which typically thwarted Chico’s scam and resulted in both brothers’ being fired. Chico became the unofficial manager of the Marx Brothers after their mother, Minnie, died in 1929. As manager, he cut a deal to get the brothers a percentage of a film’s gross receipts—the first of its kind in Hollywood. Furthermore, it was Chico’s connection with Irving Thalberg of Metro-Goldwyn-Mayer that led to Thalberg’s signing the Brothers when they were in a career slump after Duck Soup (1933), the last of their films for Paramount. For a while in the 1930s and 1940s, Chico led a big band. Singer Mel Tormé began his professional career singing with the Chico Marx Orchestra. 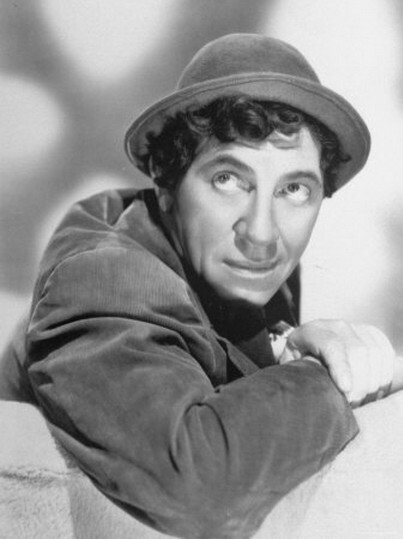 Through the 1950s, Chico occasionally appeared on a variety of television anthology shows and some television commercials, most memorably with Harpo in “The Incredible Jewelry Robbery”, a pantomime episode of General Electric Theater in 1959. Chico playing cards with himself. Chico’s lifelong gambling addiction compelled him to continue in show business long after his brothers had retired in comfort from their Hollywood income, and in the early 1940s he found himself playing in the same small, cheap halls in which he had begun his career 30 years earlier. The Marx Brothers’ penultimate film, A Night in Casablanca (1946), was made for Chico’s benefit since he had filed for bankruptcy a few years prior. Because of his out-of-control gambling, the brothers finally took the money as he earned it and put him on an allowance, on which he stayed until his death. 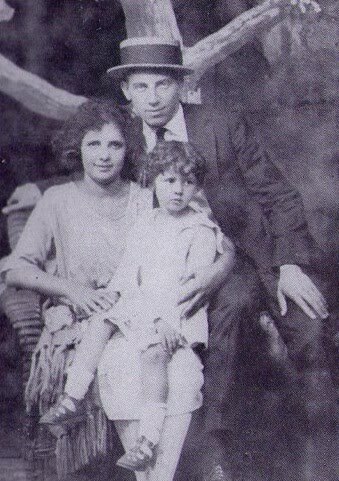 Chico had a reputation as a world-class pinochle player, a game he and Harpo learned from their father. 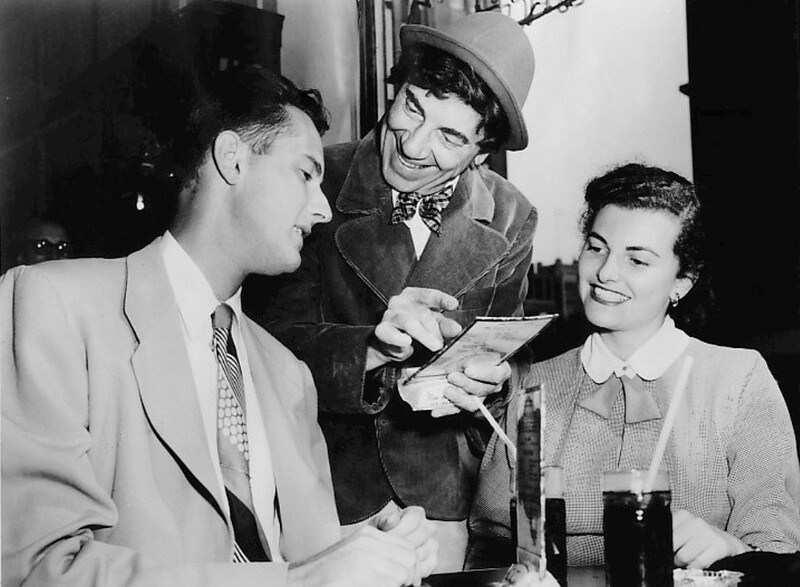 Groucho said Chico would throw away good cards (with the knowledge of spectators) to make the play “more interesting”. 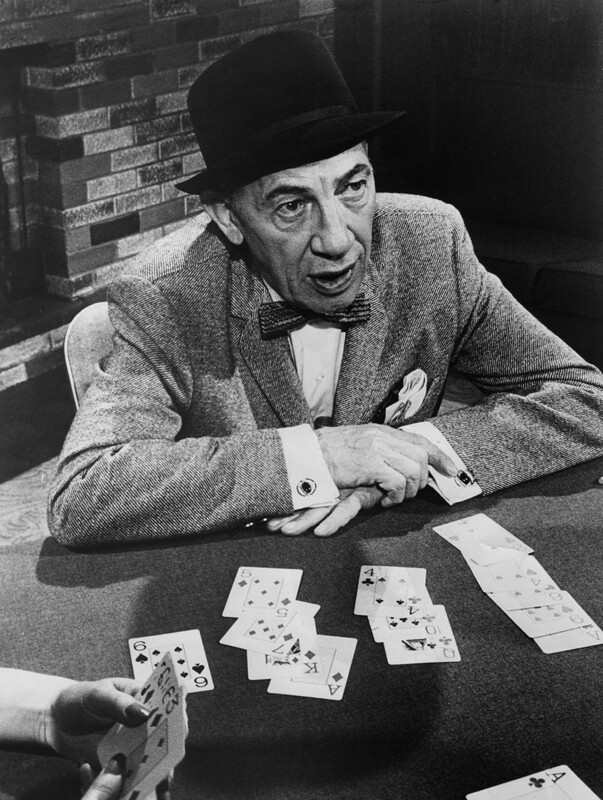 Chico’s last public appearance was in 1960, playing cards on the television show Championship Bridge. He and his partner lost the game. Chico was married twice. His first marriage was to Betty Karp in 1917, and produced one daughter: Maxine (1918–2009). His first marriage was plagued by his infidelity, ending in divorce in 1940. He was very close to his daughter Maxine and gave her acting lessons. Chico’s second marriage was to Mary De Vithas. They married in 1958, three years before his death. 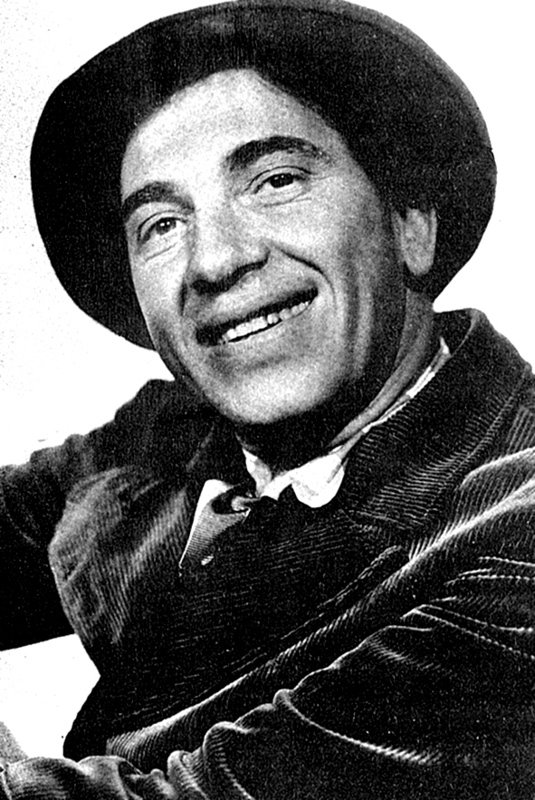 Chico died of arteriosclerosis at age 74 on October 11th, 1961, at his Hollywood home. He was the eldest brother and the first to die. 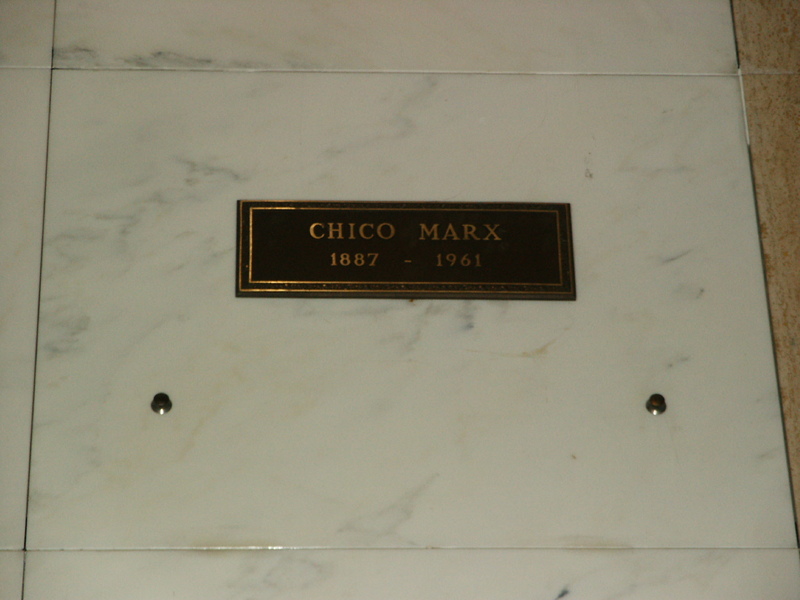 Chico is entombed in the mausoleum at Forest Lawn Memorial Park Cemetery in Glendale, California. Chico’s younger brother Gummo is in a crypt across the hall from him. According to a book of recipes by famous people (Eat Like the Stars), Chico’s favorite dish was pasta alla lido (spelled wrong). I don’t have the cookbook, but pasta alla lido is will enough known. 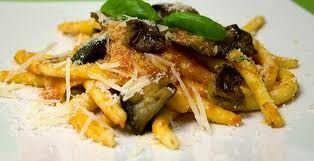 It is rigatoni (or macaroni) with swordfish and eggplant. No idea why this was his favorite, but being Italian seems apt, and it’s palatable enough. Boil the rigatoni while you are making the fish and eggplant sauce. Fry the eggplant cubes in oil over medium heat until they take on some color, then remove them with a slotted spoon and drain on absorbent kitchen paper. Then brown the garlic in the oil, remove, and discard. Turn the heat to high, add the swordfish and brown on all sides. Add the wine over high heat and add the chopped tomato. Season with salt and pepper to taste, and finish the sauce over high heat. At the end, add the eggplant to heat through. Drain the rigatoni well, and mix with the sauce. Serve garnished with mint leaves.